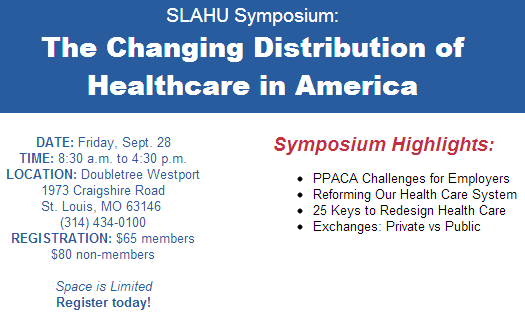 On Friday, September 28, the Saint Louis Association of Health Underwriters, or SLAHU, will be hosting a Symposium. “The Changing Distribution of Healthcare in America”. The content is expected to be similar to Zane Benefits' webinar, "Understanding Health Insurance Exchanges". The event costs $65 for members and $80 for non-members, and will be held at the Doubletree Westport from 8:30 a.m. to 4:30 p.m. Continuing Education (CE) credits for Illinois- and Missouri-based agents are available. The agenda is heavily focused on health care reform, and will highlight how the Patient Protection and Affordable Care Act (PPACA) will affect employers. From 2:00 p.m. to 4:00 p.m., Rick Lindquist, President of Zane Benefits, will speak on a panel covering public versus private health exchanges. The other panelists scheduled alongside Lindquist are Chris Free, WAHU President on the Washington State Health Benefit Exchange, and Don Garlitz, RHU, Executive Director, bswift Exchange Solutions. Insurance Agents, Brokers, and other business professionals will be expected to be the experts on key provisions of the PPACA, including exchanges. The panel will provide valuable information and answer important questions from attendees. Two CE credits will be given for Illinois and Missouri agents in attendance of the panel. Rick Lindquist is President of Zane Benefits, Inc., the leader in defined contribution employee health benefits. Zane works with brokers, agents and CPAs to transition clients to defined contribution healthcare solutions. Rick joined Zane in 2007 and was appointed President in 2011. He is a regular contributor to ClarifyingHealth.com and other health benefits publications. Rick received his B.S. in Economics and B.A. in Computer Science from Duke University. Zane Benefits, Inc, a software company, helps insurance brokers, accountants, and employers take advantage of new defined contribution health benefits and private exchanges via its proprietary SaaS online health benefits software. Zane Benefits does not sell insurance. Using Zane’s platform, insurance professionals and accountants offer their clients a defined contribution plan with multiple individual health insurance options via a private health exchange of their choice.